Unique: 4 Bells name references the bell towers from four major churches surrounding the restaurant took up residence in the old Joe’s Garage space. 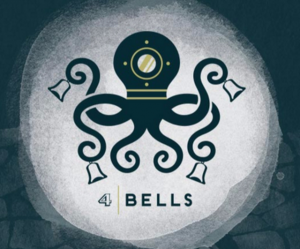 Their website says that the sound of a bell rung four times is a long-standing signal to sailors that it’s time for a break. That same sense of relief is now available for those of us landlocked in Minnesota. 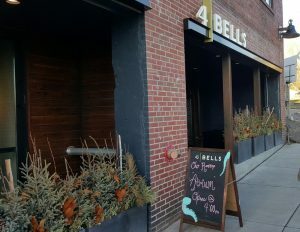 4 Bells is the place to gather and get lost in an intoxicating mix of food, drink, and Southern charm. By and large, the menu has a good variety of innovative, fresh seafood, real southern fried chicken and more, all done with craft and care. 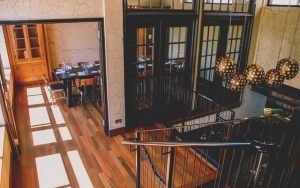 The overall ambiance feels trendy, fun, and contemporary while the dining experience is formal yet festive, with neighborhood charm, rooftop views and a variety of spaces to suit the occasion and mood. I recommend sitting near the open kitchen, which can be both interesting and entertaining to watch food preparation by the chefs. Complementary: Free Valet with $59+ dinner bill. However, no one mentioned that and the guys had no problem accepting our cash! I didn’t get an image of our tower and took this picture from their website – but it was a large portion that was fresh and quite good. 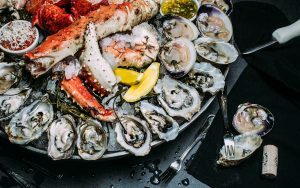 We all agreed that the peel and eat shrimp, oysters, and crab legs were the stars. We were not a huge fan of the clams. These were served with a very flavorful jalapeño ranch. They had a nice kick and we all enjoyed them. Yogurt, Granola and Antebellem Benne (I had to look that up.. Benne was an essential medicinal and kitchen garden plant during our Colonial and Antebellum Eras. It was grown in all great Carolina kitchen gardens, in particular in the forbidden subsistence gardens of African slaves who brought benne to Carolina and introduced it to the region’s nascent rice culture and cuisine.) Regardless, The salad was great and it was nice that they split them for us. The presentation was nice. The beets flavorful, apples added a nice crisp crunch and balanced out the dish beautifully with the right amount of sweetness from the granola, tartness from the yogurt and bitterness from the greens. This whole fish was quite generous and a lot of food for one person. It had a garlic chili glaze on top of one side along with some fresh cilantro. It was shared, but a lot left behind so sharing should be encouraged. 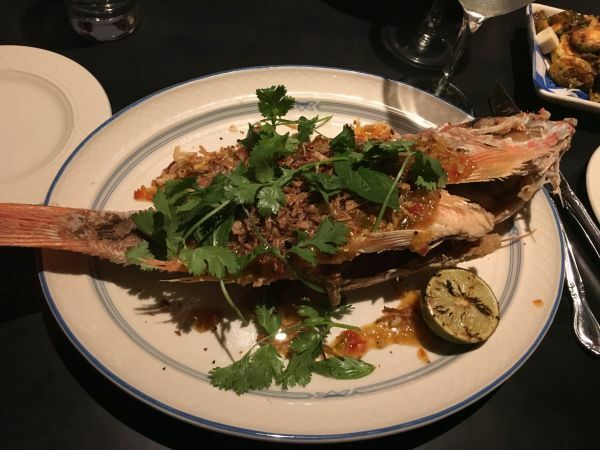 Overall it was perfectly crispy and seasoned well with a delicate flaky white fish inside once you pulled back the skin because I’m simply not into that sort of thing! 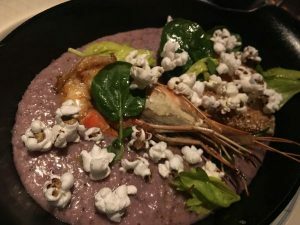 Sea Island Blue Grits, Prawn, Indigo Popcorn. This dish was just “ok” and nothing special. 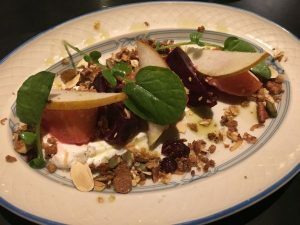 It was really bland and came served on a bed of blue grits that looked unappealing and had the color of blueberry yogurt. The popcorn was unnecessary and frankly there just wasn’t the appropriate ratio of meat to mush. Squash, Apple, Wild Rice, Duck Confit. 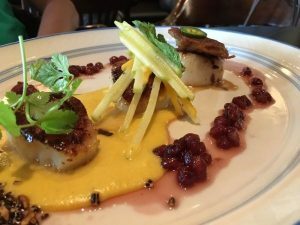 The scallops were seared to perfection and the presentation was stunning! 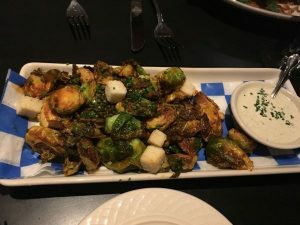 The individual flavor profiles was a nice touch on this dish and it was very flavorful. Dessert’s: We skipped it and went next door for a Port night cap. The desserts on other tables near us looked very good! The wine list was decent. 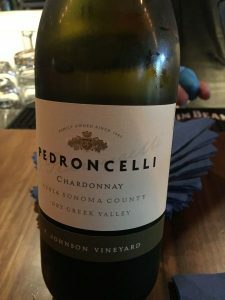 We started off with glasses of Pedroncelli Chardonnay, $9 which is a lower cost blend out of Dry Creek Valley in Sonoma, CA. Citrus, peach and floral notes in the bouquet lead to flavors of fresh peach, green apple, a touch of lemon, and tropical fruit. The blend of the two Chardonnay lots adds both fruit forward qualities and a creamy texture. Highlighted by bright acidity, the wine finishes crisp with a fine lingering finish. You can find this wine locally at Total wines for under $20, but it is good! This light to medium-bodied Sauvignon Blanc features flavors of citrus fruit with a hint of flintiness. Our server was Maria. She was knowledgeable and did a nice job of taking care of our table, while not bothering us too much! It was good, but not the best in town.